Real estate mogul Donald Trump must have been awfully hungry, because he’s eaten up a great deal of America’s time over the last year or so. His divisive, xenophobic comments may have gotten the former Apprentice star booted from NBC—except for that unfortunate time he hosted Saturday Night Live—but Trump must have known he was moving on to the biggest, most-watched reality show in the world when he entered the race for president last year. Since then, there have been debates, rallies, interviews, press conferences, and numerous other opportunities for Trump to speak his addled mind in public. And actual, working cameras and microphones have been there to capture it all. The public has thus heard every last wild exaggeration, creepy insinuation, veiled threat, and unveiled threat to escape Trump’s lips. Now that the election itself is a mere 75 days away, it’s a time to reflect: What does this all mean? What did society gain from this? 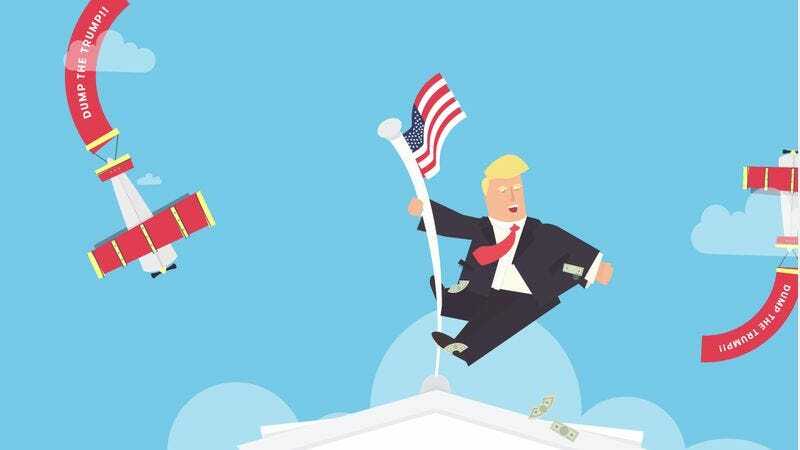 Well, for one thing, this campaign has led to the creation of Topple Trump!, a free online game from U.K. digital agency Parallax. The idea here is that the real statements are so off the wall that literally anything might go into those blanks. The people behind Topple Trump! discuss their creation at Medium. Parallax director Andy Fitch talks about the moment he realized that the campaign could be the basis for a Fibbage-style game. It all started a few months ago. I was at home watching the news and—unsurprisingly—Donald Trump was on. And as per usual, he was saying something insanely ridiculous. I thought to myself, he could literally say anything he wants and he’d probably get away with it. Which made me think—would it be possible to tell the difference between true statements and false ones? That was the beginning. Topple Trump! was born. See? All those hours America spent absorbing Trump’s rhetoric were not a total waste of time. That seemingly useless knowledge can now be applied to this game. Thanks, Parallax.